The hotel wedding experts are back on Tidewater and Tulle! Lauren, Jasmine, and their team at My Hotel Wedding is sharing what they know best: logistics of a hotel-catered wedding! With the summer wedding season just around the corner and many local or out-of-town couples are looking to the Oceanfront for an air-conditioned venue with a view, hotels can be a wonderful place to have a wedding to accommodate their guests! And with that detail, it can be overwhelming trying to figure out how many mini-grilled cheese sandwiches to pass during cocktail hour or how many signature drinks to provide throughout the whole reception. First things first, a great venue coordinator will assist you with this! And secondly, use this fab infographic as a guideline so you can realistically look at your budget and catering needs. Take it away, ladies! * Remember to eat on your wedding day. Some couples still forget! * Order finger foods to snack on like sandwiches, veggies, and fruit, so you don't faint during your ceremony! * Drink plenty of fluids during the day so your first drink isn't champagne. * Order 5-6 passed hors d'oeuvres per person. The time between the ceremony and reception is solely focused on food and conversation! * Estimate two drinks per person for one hour of cocktails. * If you're considering food stations, you should have two food stations for crowd management. * If you have two food stations, you can then cut back to 4 passed hors d'oeuvres per person. * Choose a three course meal if you want your reception to have more dancing time. Time to serve and cleanup sometimes gets forgotten when planning a wedding! * Choose a four course meal if you're a total foodie. * Don't forget to eat your cake! It's the best part! * Estimate one alcoholic drink per person for every hour of the reception. * Remember people love drinking at weddings! Have a variety of beverage options available, alcoholic and nonalcoholic. * Order midnight snacks to soak up late night drinks! Consider four pieces per guest for 60% of your guest list (as many may leave early). Are you having a hotel wedding? What kinds of foods and drinks do you want to see at your wedding? Get to know the ladies behind My Hotel Wedding through their helpful and inspiring hotel goodness on Pinterest, Twitter, Facebook, and YouTube. Photo by We Are The Mitchells and Jen Jar Photography. 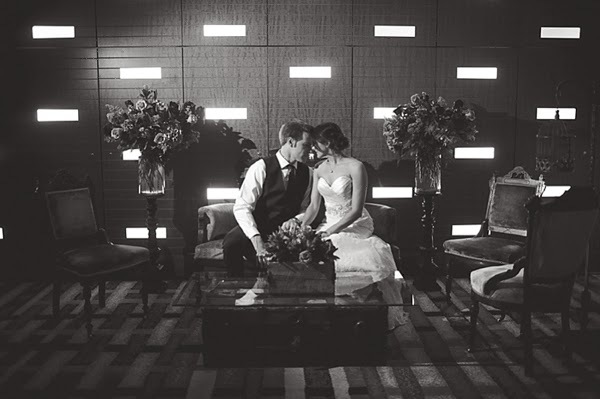 For the full feature, head over to see this modern vintage hotel wedding at the Westin Virginia Beach.